At a therapeutic riding conference I attended a few years ago, I heard a chiropractor talk about human development, spinal stability, and therapeutic riding. She was a volunteer at a therapeutic riding barn, and was amazed to see the horse naturally develop in the rider what she worked on in the office. Her explanations were so striking they still stick with me today. So I wanted to share my notes with you. Please note I’m not an MD, and not the fastest note taker, so I my have gotten a few things wrong. If you need to make a correction, please leave a comment. Also, remember, you are not a chiropractor or a physical therapist, so there’s only so much you can do with this information. 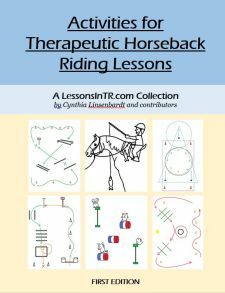 These notes are more an explanation of the benefits of therapeutic riding, and why as an instuctor developing midline awareness in our riders is so important. Hope you find this as interesting as I did! Posture, crawling, and walking follow the maturation of the central nervous system (CNS) and brain. In early development, motion drives the growth of the nervous system. Joints give the brain feedback, which drives the development of more circuits and uncover genetic systems of motor programs as the child develops. Sagittal stabilization = the basis for stabilization, the fixed point from which muscles of movement (arms/legs) can pull from. If you keep stable, joint motion can occur! These work together to hold a joint in its right place and allow purposeful movement. They function as a unit – when one area decentrates, it affects another area. For example, if you have tight hamstrings and bend over, you may pinch a nerve in your back. If the CNS and brain have a disability, correct body motor development may be hindered. “Riding puts the body in the developmental posture of hip flexion underneath spine; an invitation for joint concentration and muscular synergy”. 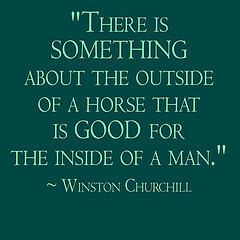 Sitting on a horse encourages the rider to find midline. Always ask, “Are they symmetrical?” Anywhere there’s asymmetry, work on it, because once there’s symmetry, the joints ready to do more complex things.